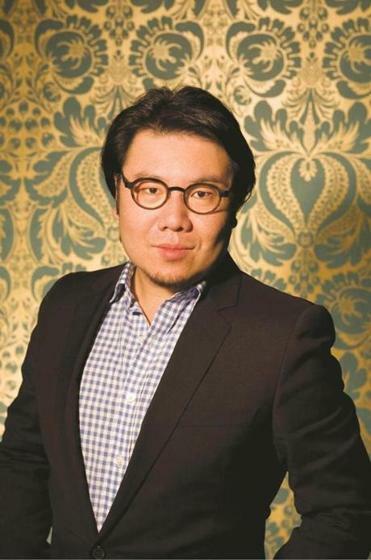 Kevin Kwan takes time to educate the reader with translations of Cantonese, Hokkien, and Mandarin words. Kevin Kwan’s rollicking, often-riotous debut novel, “Crazy Rich Asians,’’ reads like a behind-the-scenes primer of the rising über-elite of the ever-powerful Asian world. With the author’s exhaustive cast of characters largely hailing from three families (the Youngs, the Shangs, and the T’siens), the reader is given an intimate window into the spending and investing patterns, and burgeoning and crumbling relationships of this upper echelon of extraordinary wealth. There are private jets (equipped with yoga studios), privately owned islands, outlandish resorts, and bible study circles where the women are more passionate about stock tips than biblical verse. Amid all of the wildly well-to-do characters, this novel predominately tracks the relationship of one young couple, Rachel Chu and Nicholas Young. Initially, the story sounds familiar: Two professionals meet through a colleague and steadily fall in love. They are regulars at Tea & Sympathy and leisurely stroll the sidewalks of Washington Square Park hand in hand. After two years of being together, Nicholas invites Rachel to spend the summer in Asia with him, first attending the wedding of his best friend in Singapore and then exploring the rest of the region. It is at this point that Kwan’s narrative flies off the rails into another stratosphere of existence and wealth. Nicholas is the likely heir of one of Singapore’s most prestigious, old-money families, and has been trained not to discuss his background. In contrast, Rachel comes from less-than-modest circumstances, raised by a single mother who emigrated from China and worked at a string of Chinese restaurants before becoming a realtor. Upon arriving in Singapore, Nicholas and Rachel soon attend their first formal gathering at Tyersall Park, the sprawling, clandestine palace of Nicholas’s grandmother. The couple is among many cousins and relatives who have been invited to witness the tau huas flowers blooming, an event that rarely occurs. “In the Andalusian courtyard, Rachel allowed her eyes to close for a moment,” writes Kwan. “The strums of the Chinese zither created a perfect melody with the trickling waters, and the flowers in turn seemed to be choreographing their bloom to the mellifluous sounds. Every time a breeze blew, the copper lanterns strung against the evening sky swayed like hundreds of glowing orbs adrift in a dark ocean. Rachel felt like she was floating along with them in some sybaritic dream, and she wondered if life with Nicholas would always be like this.” As the reader suspects, this version of paradise doesn’t last for long, and Rachel swiftly finds herself caught in a tangled web of fierce competition and cunning lies. Secondary narratives also examine the tenuous equilibrium of intimate relationships, money, and status. There is Astrid, Nicholas’ cousin who spends months in Paris purchasing the latest couture, and her husband, Michael, a tech professional who prefers to live within his own means. And then, Colin Khoo and Araminta Lee, the Asian wedding of the century (which includes a ferry ride to an exclusive island, complete with a performance of Cirque du Soleil). As a way of educating the reader, Kwan provides myriad footnotes, which offer translations of Cantonese, Hokkien, and Mandarin words, as well as further explanations of the high-end culture and society. The author’s wit adroitly penetrates the fine print. One of the few drawbacks of the narrative is the deliberate litany of name-dropping and designer brands, which grows a little wearisome. That said, with each chapter, Kwan skillfully moves the narrative forward with escalating tension. There are private detectives, assumed infidelities, and salacious rumors that construct an elaborate shell game of sorts that effectively engages the reader. Kwan also orchestrates a commanding narrative, where he seamlessly rotates the close, third-person points of view of his intricate constellation of characters without missing a beat. “Crazy Rich Asians” is an entertaining, engrossing novel. Kwan certainly knows how to tell a lively, generous story of shallow extravagance and human devotion. S. Kirk Walsh, a fiction writer in Austin, Texas, can be reached at skirk.walsh@gmail.com.